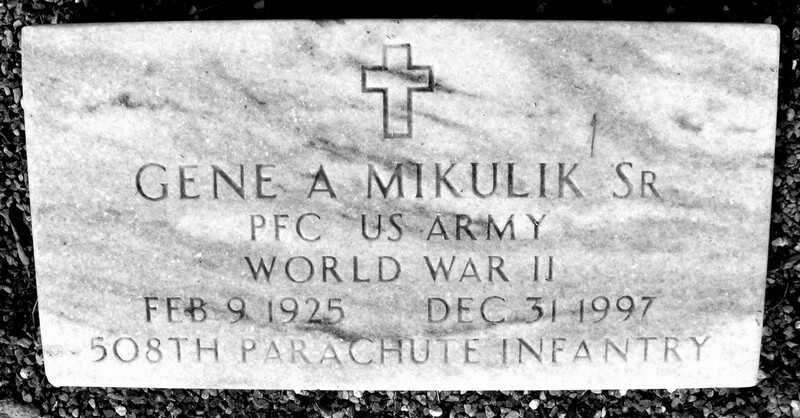 Grave marker for Gene A. Mikulik in the Praha Catholic Cemetery, Praha (Fayette county), Texas. Gene enlisted in the Army at Fort Sam Houston, TX on 18 May 1944. Pvt Mikulik was transferred from the 3rd Replacement Depot to Company F, 508th on 15 Feb 1945. He was awarded the Combat Infantryman Badge for action during campaign, 18 Dec 1944 to 20 Feb 1945.